IT MAY BE SURPRISING that one true thing in my novel Thieving Forest is the plethora of sisters in one family. I grew up with six sisters—yes, seven girls in all—and no brothers. When writing Thieving Forest I condensed the number to five, since I thought seven would be just too many for a reader to keep track of, but they are based on my real siblings. Like the sisters in the novel, we grew up in Ohio, albeit an Ohio with running water and antibiotic ointment. Thieving Forest takes place at a time when the roads were mostly deer paths. What did I steal? An account of being bit by a snake by Samuel Prescott Hildreth, and a description of a Moravian dinner/ceremony with Native Americans by David McClure. I read accounts by early Jesuits who visited Native American tribes almost two hundred years before my novel took place, and I was also heavily influenced by the conquistador Cabeza de Vaca, who found himself lost and wondering among Native American communities in the Southwest in 1540. What I didn’t steal was the sense of sisters as role models; my sisters were the people who shaped my sense of myself as a reader (like them), who had progressive values (like them), and who were so like me in both wonderful and annoying ways. 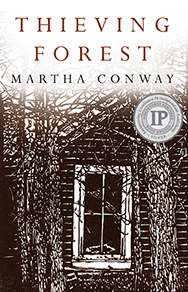 Thieving Forest is a story about an abduction and a search for those taken. It is also a story of survival and transformation—in fact, many different transformations—within one family. Susanna Quiner watches from behind a tree as her four older sisters are taken by a band of Potawatomi. Left to her own resources, Susanna decides to go after them herself. But as she finds her sisters one by one, she discovers that they have changed. Part of her transformation is accepting her sisters’ new lives, and forming her own life without them. Isn’t this the way of any family, historical or modern? We spend years and years growing up together, and then we go off to school or to jobs or to have our own adventures, and everything changes. The details might differ (antibiotics, better roads), but in essence siblings—especially younger siblings—have experienced the break-up of families from time in memoriam. We grow up, we leave home, and we change — often in that order. And the process of accepting our sibling’s life choices can be difficult. So although the story of Thieving Forest is fiction, I like to think that the essential feeling beneath it is true. What is real is what we pin the details on: human nature. And you just can’t make that up. Get more information or order here!